Home · Property Management · Latest News : Is Tenant Monkeying With Disabilities Laws? 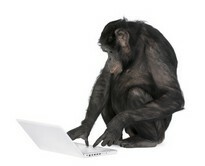 Is Tenant Monkeying With Disabilities Laws? Rent it Right by Janet Portman, Inman News Q: My apartment complex specifies “no pets.” A tenant has just asked for permission to keep a monkey — no, she didn’t even ask, she announced — that the monkey would be living with her. She claims she needs it as a service animal, and she has shown me a letter from her doctor, which says that in his opinion, she needs the animal. Do I have to allow the monkey? –Jared D.
A: A service animal is “any animal individually trained to do work or perform tasks for the benefit of an individual with a disability,” according to the Americans with Disabilities Act. When that law was signed in 1990, it’s doubtful that Congress envisioned much more than seeing-eye dogs, but the definition has been expanded in states (and some cities) that have written more inclusive protections. In San Francisco, for example, service animals can include reptiles, pigeons, chickens and rodents. Let’s assume that you, like most landlords, are not covered by any law other than the federal ADA. The first issue is whether your tenant is legally disabled — that is, suffering from a condition that significantly limits a major life activity. For conditions that aren’t obvious, you are entitled to ask for substantiation of the tenant’s claim. This verification traditionally came from a treating physician, but in recent years federal regulations have expanded the type of source that will qualify to include peer support groups, nonmedical service agencies, or even reliable third parties (usually understood to mean a third-party professional), for example. Tenants typically hand you a doctor’s letter or note, which usually says only that the doctor concurs with the request. Arguably, you’re entitled to more, and the way to get it is to ask the tenant to give the doctor your own form to fill out. Such a form should include the legal definition of “disability,” so the doctor knows that a medical condition, however legitimate, that does not substantially impair a major life activity will not qualify. Then, ask the doctor to describe the training and the work or task that the animal will do. Finally, have the doctor initial a statement that, if subpoenaed, the doctor would be prepared to testify in court consistent with his representations on the form. A doctor who is treating someone with a true disability, who has proposed an appropriate service animal, should have no trouble signing the form. But a doctor who is simply going along with a patient’s request or doesn’t know the legal definition of “disability” may well think twice. Once you receive written verification that the tenant is legally disabled, and that the animal meets the tenant’s needs, in most cases you must allow the animal. But this animal, like any other, must not pose an undue threat of harm to other people or property. Landlords who have encountered service animals that are vicious toward others find themselves in the unenviable position of being caught in a tough spot: possibly liable for other tenants’ injuries by allowing a dangerous condition to exist on their property, and having to respect disabled tenants’ rights to keep service animals. See Janet Portman’s feature, Canceling Rental Will Cost Landlord.